Trying to stay on the fashion curve in London. People here are very fashionable. I often feel like a complete slob here in London. I'll be out wandering around the mall or the train station, and I will be amazed how well put together everyone looks. I was at the pub a few nights ago with some friends, and I was noticing how dashing all the people in the pub looked, making me feel about as fashionable as an American tourist with a fanny pack. What is amazing about it, though, is that they aren't wearing anything very pricey or avant garde. The guys were all just wearing jeans, trainers and t-shirts, the girls were all wearing jeans and sweaters or shirts. Nothing necessarily cutting edge, but some how they all seem to carry it well. As such, I have been trying to keep up. I know I'll never be on the cutting edge of fashion, or even ahead of the curve, but if I can at least look like I am not dressing in the dark, that'll do. I'm starting to get there. One of the secrets I have learned is the scarf. This is me with a scarf. The scarf I am wearing I brought with me from Canada. I bought it there probably three years back, and probably wore it a total of 10 times in the 3 years. Mostly, it was when it was freezing cold, and so face protection was needed. On those days, I would wrap the scarf up around my head, covering my ears, nose and mouth to try in an attempt to use my warm, moist breath to warm my face without (hopefully) causing me to asphyxiate from carbon dioxide poisoning. 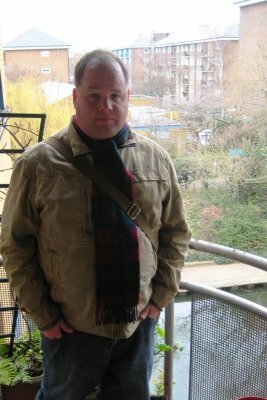 Here in the UK, though, I wear my scarf a lot, because everyone wears scarves, and they all look so stylish. I'm pretty sure I would have gotten beaten up for being a sissy-boy for wearing my scarf in Canada. Here in the UK, everyone wears scarves, even tough as nails rugby players and goonish football fans. On days that are chilly, when in Canada we would have probably gotten a heavier jacket with better neck protection, here they put the same jacket but a fluffier scarf. Sometimes I see people wandering around wearing a t-shirt and a scarf, an odd mixture that says, "my arms are basking in warm, but my neck is cold. Today, heat isn't rising, but rather staying below shoulder height." I've also learned a lot of new ways to tie scarves. I am using a simple knot tied with the scarf uneven around my neck. That allows the longer end of the scarf to hang down the front of the jacket, almost like a really thick tie. I use this because the scarf I have is very short, and I can't tie it like the most fashionable people do. They get a really long scarf, and then fold it in half (drawing the two ends together, so it is now a double scarf half the length). You then slip the two loose ends through the other end and wrap around your neck. The nice thing about that knot is that you can wear it tighter or loosely, depending on the weather, occasion or number of hot birds in the room. You want to see this in practice, check out this men's fashion advice from the Telegraph. Of course, Beckham has got it all correct. They call it the "Chelsea knot." Damn, if only I was that fashionable. I have the heart for it, just not the hair nor the right scarf. Scarves are awesome. I never used to be a big fan either, but started wearing one last winter and I now feel naked going out without it. Good to know the name of the knot; learn something new every day! !